One of the things that’s tough when you’re spiffing up your house is figuring out a way to display your collections without looking like a crazy person. Though, let’s face it—you could have nothing but a single pair of mouse ears in your house and there’s always gonna be someone who will spot it and decide you’re a Disney fanatic and spend the rest of her life sending you crap with Mickey Mouse on it. When we finally realized we needed professional help (with the apartment, that is! 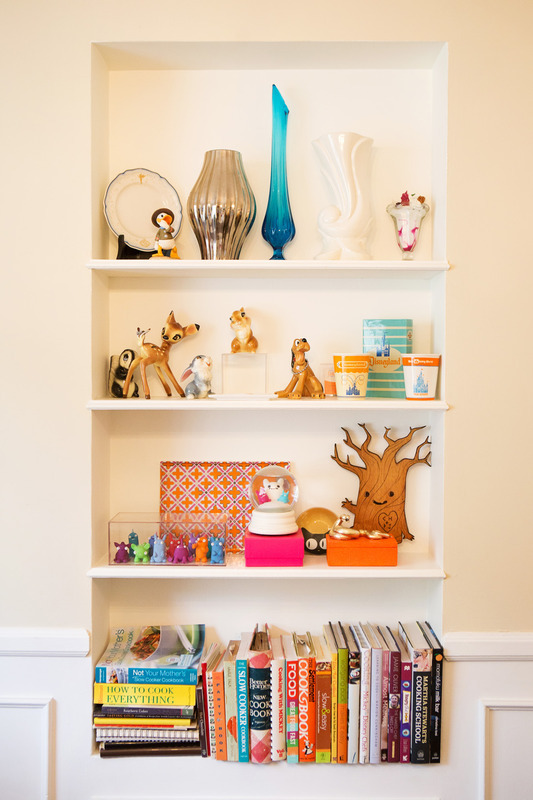 ), we found up-and-coming interior designer Leslie Landis through her home tours on Apartment Therapy. She’s been helping me redirect my bright-color mania into an interior style that’s more sophisticated than I am capable of on my own (i.e., less like an exploded box of crayons). I really really wanted a classy-looking living room, and she delivered! 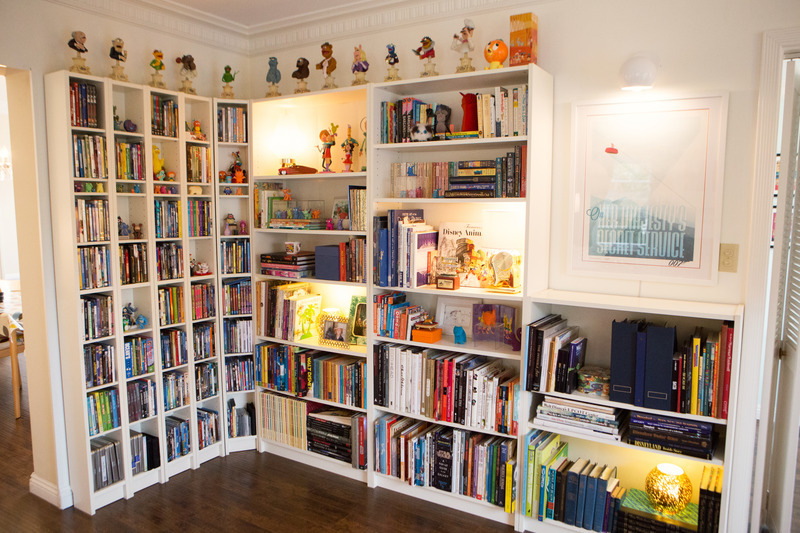 Part of the way she managed this was to restrict most of our Disney tchotchkes collection to our apartment’s two built-in bookcases and the library of Ikea Billy bookcases in our living room. We took everything off the shelves and decided where all the lights should sit. Then she spent two days figuring out how to put it all back in a way that looked good. Of course, now we’re terrified to move even one book lest her perfect design come undone, but at least it’s kept us from acquiring more! …And then turn around and it’s a DISNEY-SPLOSION!!!! Patrick’s beloved Sideshow Muppet busts. 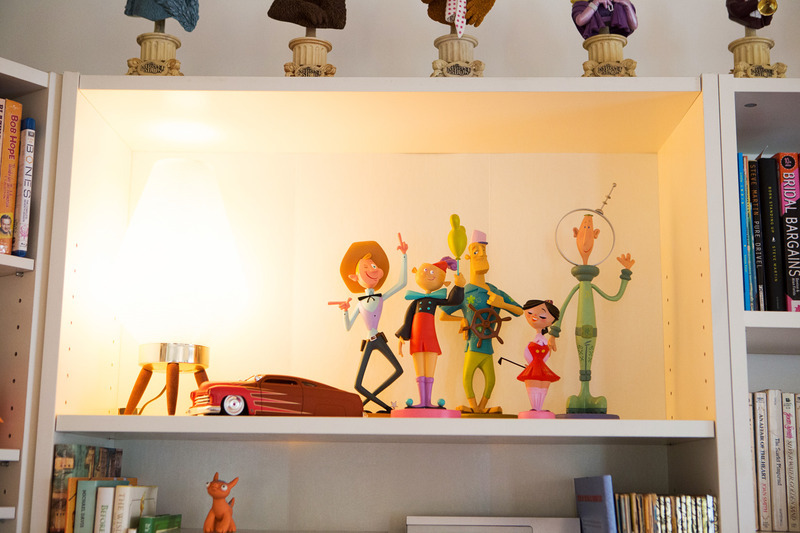 Kevin Kidney & Jody Daily’s Disneyland Cast Member figurines, one for each land! Leslie also helped us liberate some of our Beastlies, which live mostly in display cases after Nacho (a.k.a., The World’s Bitey-est Cat) zombiefied a bunch of them. Why yes that IS a bear carved out of Ivory soap by a third-grade me! 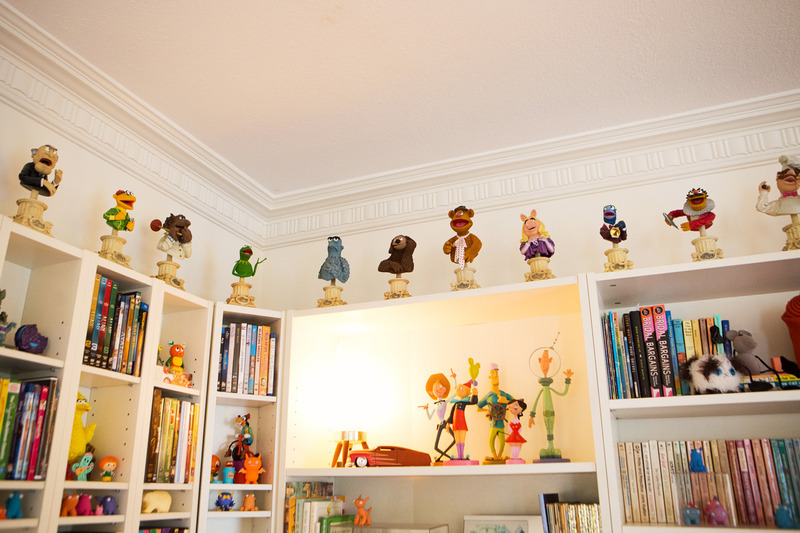 I’ll do a separate post on our Mary Blair dining room, but here are the wonders Leslie wrought with the bookshelf! 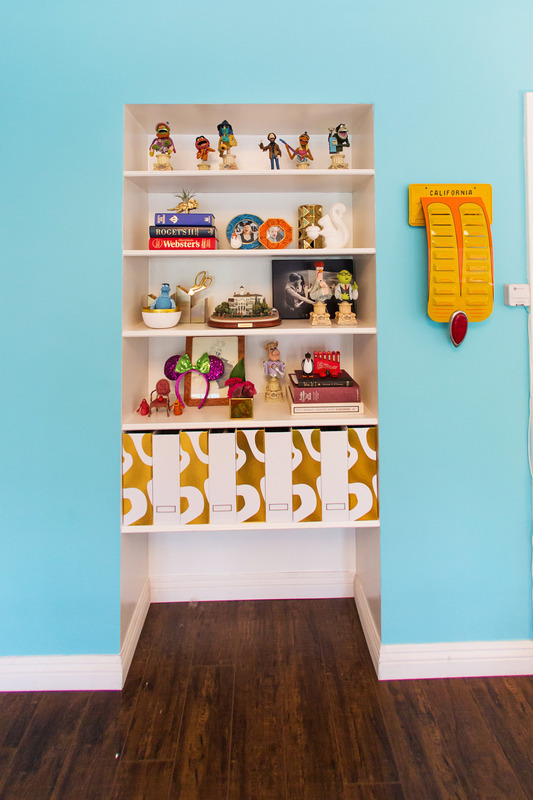 And here’s what she did with the office shelves! Thanks to the Roots for all these lovely photos of our Disney mania! Just a quick question about the Beverley Hills Hotel wallpaper you used on that one wall in your living room. Did you buy direct from Martinique Wallpaper? Or were you able to find it any cheaper elsewhere? It’s SO gorgeous but soooooooo expensive. No—and believe me, I looked! I am the Queen of the Deal! They have exclusive rights to make it, so they can pretty much ask what they want. 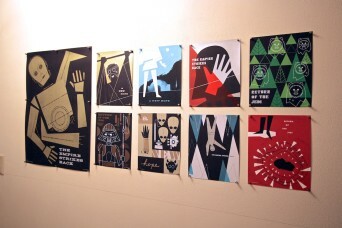 (Also, it’s hand silk-screened, which helps account for the higher price tag). However, check out Dorothy Draper’s similar pattern, called “Brazilliance.” It’s now sold by her protégé, Carlton Varney, and it’s less than half the cost of Martinique if you buy it on Etsy or TwentyOne7. It doesn’t look like it at first, but Brazilliance comes in 10-yard double rolls for $300, whereas Martinique is priced at $352 per 15-foot single roll and sold only as triple rolls. The Glam Pad has a great breakdown of the differences between the two. 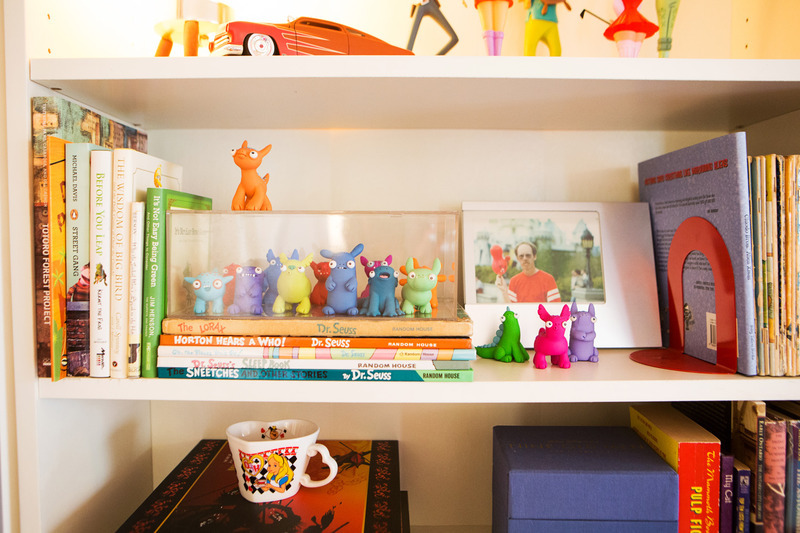 Where on EARTH did you get that adorable, round Figment figurine? The original incarnation of Journey Into Your Imagination played a big part in my childhood (I think I’ve actually seen all 3 incarnations of that ride, for better or worse), and I’d love to find collectible Figment merchandise other than pins and novelty t-shirts. Hi Meg! He’s a Vinylmation! He’s from The Park Starz Series 1, and you can find him on eBay. There’s also a variant wearing a sweater on Amazon! Where did you get your curtains? I love them! In the living room? Right here on Overstock.com! We did have to buy an extra pair that our seamstress used to extend them to reach our floor, but they were so cheap that it wasn’t a huge deal. Looks great! Love everything – especially how it goes from sophisticated to fun, but the whole look is cohesive. 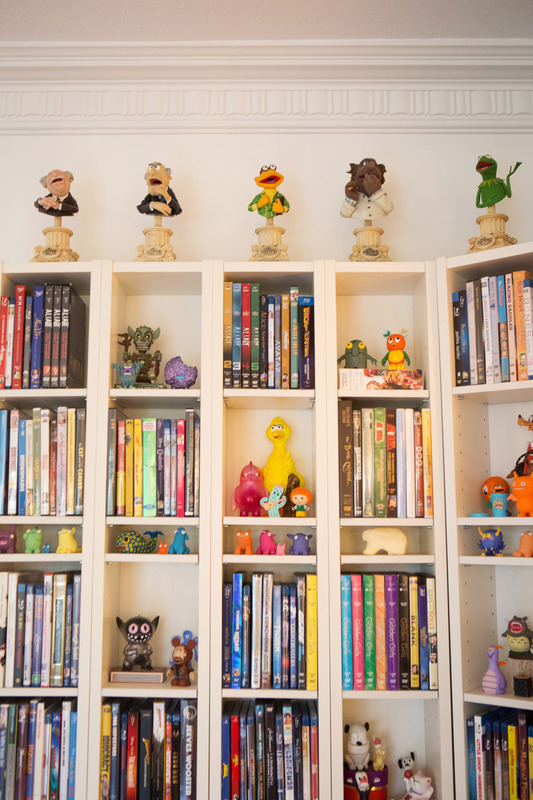 That is an awesome collection of muppets, by the way! Thanks! Those are the Muppet busts made by Sideshow more than 10 years ago, which he collected because they are the best character likenesses he’s ever seen—even better than some of the recent puppet rebuilds by Puppet Heap! This is fantastic! Leslie really made your collection look so amazing and organized. This post has pretty much convinced me I need to hire a interior decorator when I move into my new place after our wedding. The trick is to find someone who’s newer to the game and willing to work with projects on a lower budget. I’d always just assumed all interior designers were at the $$$ mansion-full-of-antiques level. 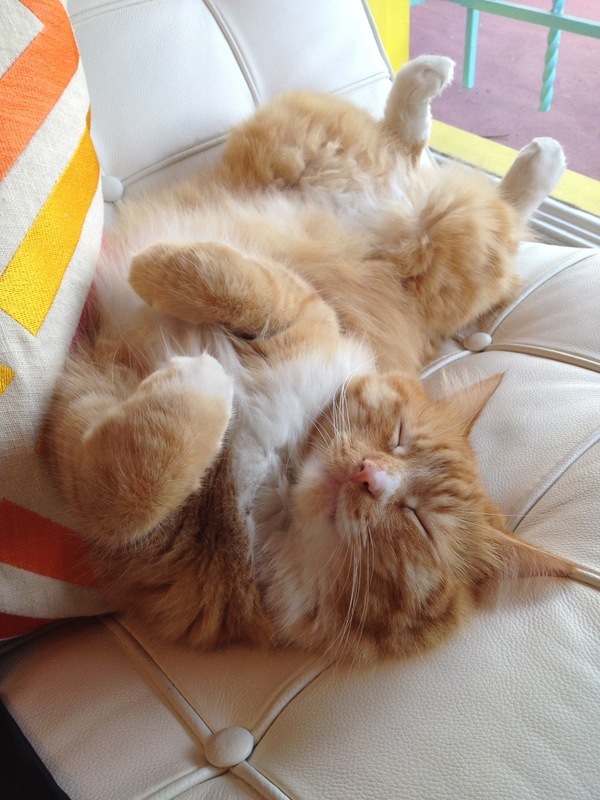 We tried one of those services (Homepolish) and didn’t like it. But then I started to notice younger designers with fresh ideas on sites like Apartment Therapy and Houzz and discovered there’s a whole niche of affordable interior design! That looks awesome guys – very fancy!! Love this post, Carrie! I’m currently (mind-)planning how we style our new home that we plan to buy after our Disney wedding. 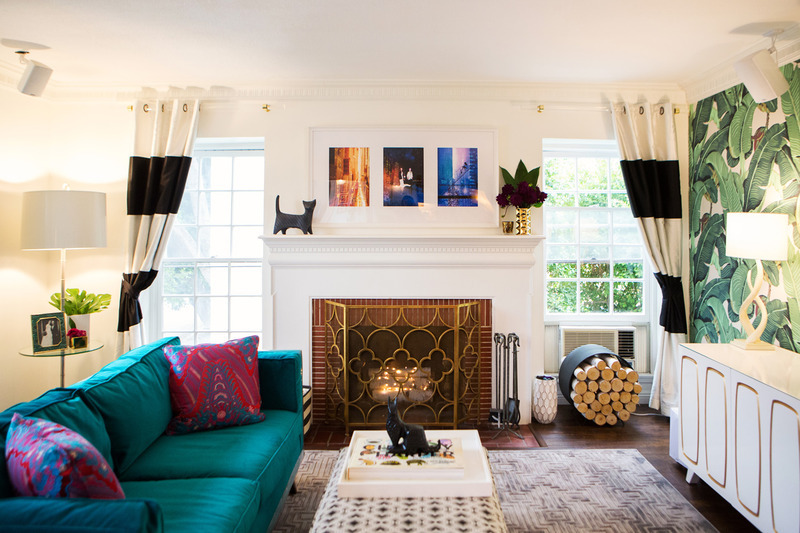 I was totally into the look of your living room from the last post! 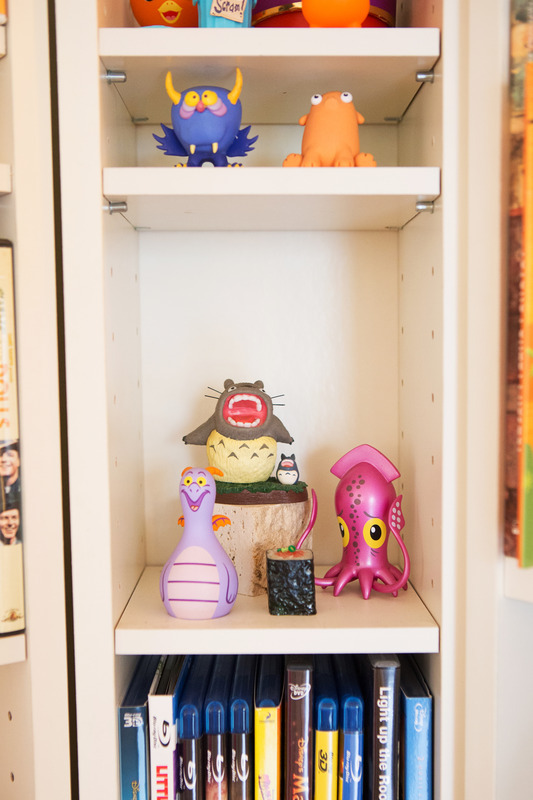 We have a video game/Disney merch collection and I definitely need new ideas to display them. Thanks for sharing! Thanks! It can be tough to embrace stuff like video games and big TVs in one’s decor when sooooo many home blogs go on and on about how to hide them. But Leslie has helped me embrace the idea of decorating for the way we actually live! Wow!! I LOVE this! It’s fun and Disney without being too cheesy. It’s sleek and really displays the figures and books in such a fun way. I love it! Thanks so much, Amanda! I’ll pass your compliment on to Leslie.